The 2016 Chairman’s Council trip kicked off in Dublin on April 10. Fionnuala Croke, Director (center front), and Jessica Baldwin, Head of Collections (center back), of the Chester Beatty Library at Dublin Castle, showed us treasures from this gem of a library founded by the namesake American philanthropist and entrepreneur. After tea, Nateghe Moane provided an overview of the collections, which ended with a delightful concert of ancient Irish music. The following day, Dr. Sandra Collins, Director (second from left), and her staff gave us a tour of the National Library of Ireland. There was a marvelous W.B. Yeats exhibit and one on the 100th anniversary of the Easter Uprising, as well as other historical materials. After lunch at NLI, Helen Shenton, Librarian and College Archivist for Trinity College, Ireland, current ATBL Advisory Council member and former librarian at the British Library and Harvard Libraries, closed the room for a private viewing of the Book of Kells (video below), followed by afternoon tea at the college. Early the next morning, we boarded a private coach to Armagh Public Library, the oldest library in Northern Ireland. 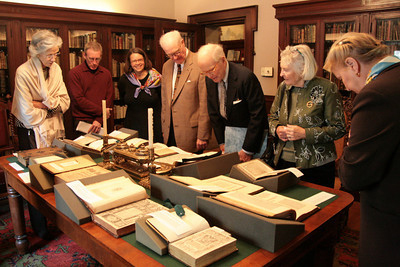 Dean Gregory Dunston (second from left, below) was our gracious host and his staff showed us a rare first edition of Gulliver’s Travels with Jonathan Swift’s annotations and other newly discovered items among their collections. We then visited the Registry House and St. Patrick’s Cathedral where High King Brian Bora is buried. 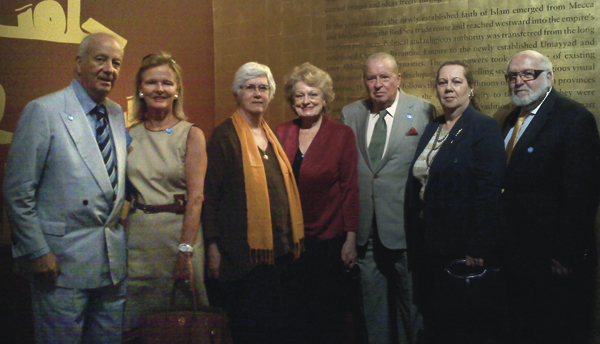 The Earl and Countess of Caledon House then invited the Dean and ATBL members to lunch at their castle. As their property is on the border of Ireland and Northern Ireland, they had some fascinating stories to tell about withstanding bombings and bullets. Working with the Prince of Wales, the Countess and Earl (second and third from left) are using their land in more sustainable ways to reduce, reuse, and recycle materials and waste. Next up was Hillsborough Castle, seat of the British government in Northern Ireland and now part of the Historic Royal Palaces. It is in the process of expanding its outreach and education to visitors and the community. Patricia Corbett and Christopher Warleigh-Lack (right) talked about these plans and Stephen Martelli led us through the castle and gardens. In the afternoon, the ATBL group flew from Belfast and met up with additional guests for dinner at the Cambridge City Hotel. Thursday was a full day. Dr. Stella Panayotova (left, below), Keeper of Manuscripts and Printed Books, of the Fitzwilliam Museum showed us a plethora of rare books and manuscripts, whetting our appetite for a future tour of the museum. Then, our good friend Christopher de Hamel (right), Librarian of the Parker Library, Corpus Christi College, brought out magnificent rare books and manuscripts followed by a lovely lunch in the Parker Room. Dr. Nicolas Bell (below), Director of Trinity College Library, formerly of the British Library, entranced the group in the afternoon. At the end of the day, we returned to London for the much anticipated opening of the British Library exhibition, Shakespeare in Ten Acts. On Friday, the British Library gave us a curator-led tour of the Shakespeare exhibition, a display by William Frame of Freemasonry materials, lunch hosted by Baroness Blackstone and Roly Keating, American treasures with Phil Hatfield, and tea with the curators. Tessa Smith, long time ATBL member and Vassar graduate, hosted a cocktail party that evening at the University Women’s Club. Saturday morning, our final day, Susana Caldeira and Gabriele Rossi Rognoni gave us a tour of the Royal College of Music‘s ancient instruments collection. The trip concluded with lunch at Bistro 190 at the Queensgate Hotel with shared memories and suggestions for future trips. Our busy spring was highlighted by an informative tour of the Watson Library at the Metropolitan Museum of Art, hosted by Ken Soehner, Arthur K. Watson Chief Librarian, and Mindy Dubansky, Preservation Librarian. 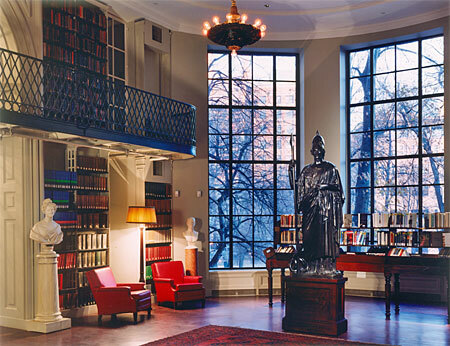 The Watson Library is the principal research library for the Met, with a collection of close to 800,000 volumes, and a beautifully renovated Center for Book Conservation. Many thanks to Nancy Mandel for all her arrangements and generous hospitality. 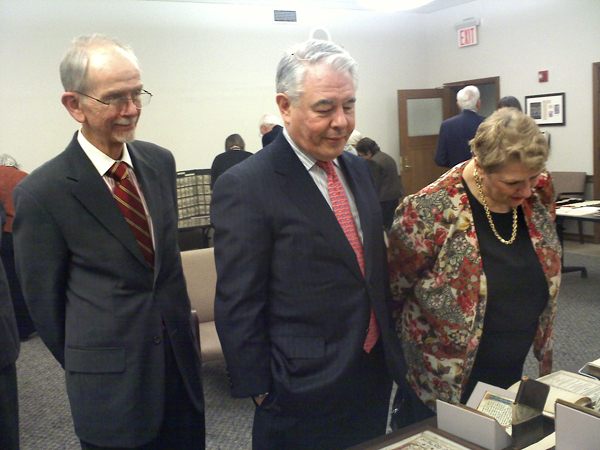 Dr. Michael Ryan, David Redden and Linda Watrous viewing illluminated manuscript. 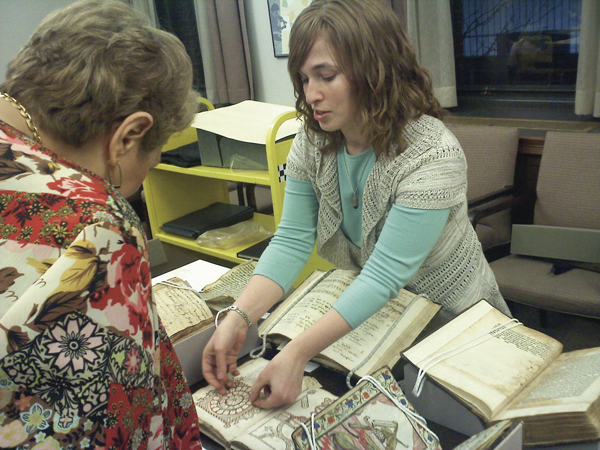 Curator showing Hebrew texts at Columbia University Library. 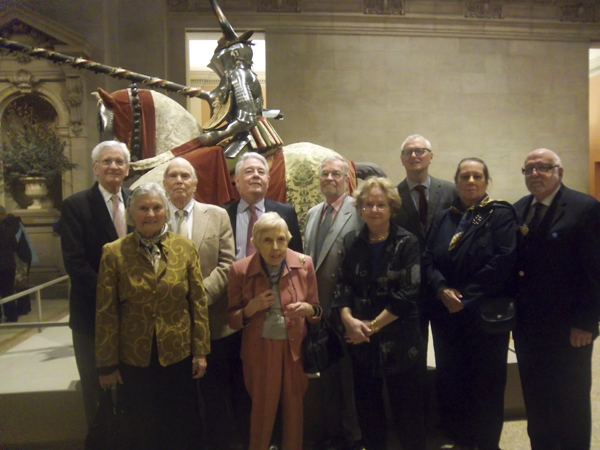 James & Anne Sitrick, Dr. Helen Evans, Elizabeth & Stanley Scott, Caroline Rubinstein & Phillip Winegar at the Metropolitan Museum. 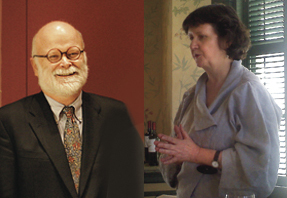 William Stoneman and Helen Shenton of Harvard Univerity Libraries. 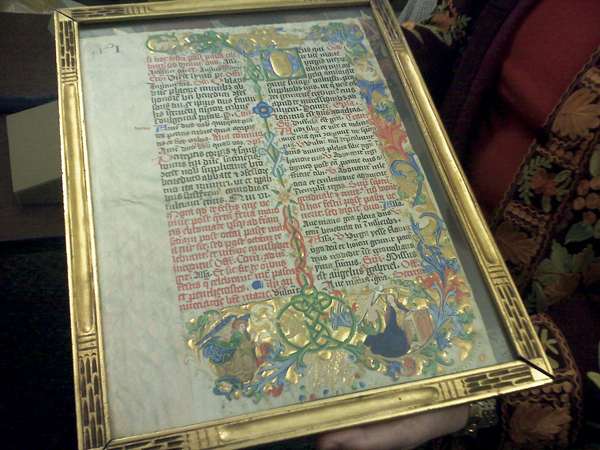 ATBL members view rare books at JCBL. This past October ATBL members journeyed to Providence, RI, to see the remarkable collections of the John Carter Brown Library, the John Hay Library, the Providence Athenaeum, and the library and art works of the Rhode Island School of Design. They received private tours by the directors and curators and examined the rare treasures each institution owns. The JCBL houses an internationally renowned collection of primary historical sources pertaining to the Americas before c. 1825. The John Hay Library has the foremost American military collection and outstanding Lincoln rooms. The Athenaeum is Providence’s oldest cultural institution and America’s fourth oldest library. It contains rare first editions of 19th century American authors, including Edgar Allen Poe who used to meet his girlfriend there escaping the eyes of her mother. The Rhode Island School of Design Library is a marvel of re-use, taking a bank building and turning it into a multi-layered, multiple use student center. The RISD Museum, across the river, had a special site-specific installation of glass artist Dale Chihuly (RISD MFA ’68 Ceramics) to inaugurate the new building which contains 80,000 works from Greek and Roman sculpture to French Impressionist painting, plus a large collection of 20th century art. The ATBL offers one rare book viewing and one domestic trip a year. One of the benefits of being an ATBL Library Fellow donor and above is being invited to these rare-book viewings and special tours of libraries.